1000 sensational tattoos in Traditional and Old School style. Black & grey, sketches, line-work and in color. 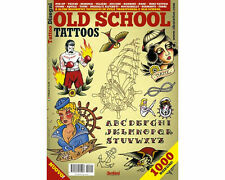 (Qty-1) Old School Tattoos Flash Design Book 64-Pages. Tattoos” brings together the most representative and powerful designs from both old school and traditional styles. These slick looking prints are made from original Sailor Jerry (Norman Keith Collins) tattoo flash artwork. tattoo flash set 1. A4 size black and grey 10 laminated sheets . with linework! This sheet is the closest to the original sheet as could be possibly made. colors on this one are super cool and 70s goodness. CONTENT Tattoo Flash and History. BINDING Spiral. CONTENT Tattoo Flash and History. TATTOO ILLUSTRATIONS. 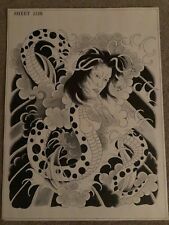 Sp iral Bound Book OVER 1000 Shaded Tattooable Designs also includes linework! Also Includes Table of Contents. All Design will include linework. Many, Many more. Samurai Masks. Background for Wagner association: An associated and related sheet of this flash is seen on a very old cabinet card of Charlie Wagner tattooing. It looks like he propped the flash up in the foreground of the photo. He later tattooed for many years in Norfolk, South Carolina and Florida. His tattoo flash was and still is truly revered as works of art. Other tattooers would obtain his flash, "porkchop" it, cutting out his designs, gluing them to other boards and displaying his art as their own work. ARTIST Horiyoshi III. The great Horiyoshi III Nakano Yoshihito has no need for introduction: for over forty years he has been tattooing, painting and drawing and is world renowned for his incredible and versatile talent. By comparing to sheets of flash in the eddie poferl book, the designs and the style are remarkably similar to poferl's flash. ANTIQUE TATTOO FLASH" BOOK. DESIGNS BY PROF. EDDIE POFERL PHOTOS OF PROF. EDDIE POFERL. If you are only going to buy one flash sheet book, this is the one to get because stars are the most requested tattoo, and this book has massively more variations of stars than any other flash book! Stars are the most requested tattoo- so what do you have on your wall?. "Tex Rowe Design Book"contains forty pages of incredible chest and back designs from the Mike Skiver collection! This beautiful spiral bound flash book is full of valuable reference material and tattoo history. The Cliff Raven Studio was one of only six studios featured in the 1982 publication The Rock Star Tattoo Encyclopedia, by Patricia Steur, who stated, "In other words - this is one of THE places throughout the world where it's worth going to get a tattoo.". ARTIST Mike "Rollo" Malone. The set includes Vol. 1 & 2 from 2006 and Vol. 1 from 1996. CONTENT Line Drawings. WEIGHT 2.4 lb. He worked with lou sciberras in florida, mr. tramp in texas, paul rogers/zeke owen in jacksonville, nc, extensively in texas and biker conventions with many other folks. the lot includes original & production flash, tracings and photos. Magazine is 9' X 11" 108 pages Excellent Condition. Calligraphy Letters Tattoo Flash Design. (Qty-1) Calligraphy Letter Tattoo Flash Book Design 66-Pages. own tattoo. Great reference for custom design or decoration letters. More then 40 different alphabets. TATTOO FLASH "RELIGIOUS FLASH" ON CD/DVD 110 SHEETS WITH LINE WORK! 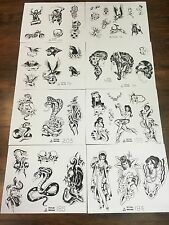 200 PREMIUM TATTOO FLASH SHEETS W/LINE WORK. - PRAYER HANDS. - PLUS 100 BONUS SHEETS (VARIOUS FLASH). CONGRATULATIONS, YOU HAVE JUST HIT THE LOTTERY! - RIBBONS AND WRITING. tattoo flash set 3. A4 size blac and grey 10 laminated sheets.with linework! 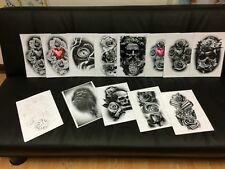 Tattoo flash set A4 size black and grey 10 laminated sheets. Stencils are scanned and resized to show details. Box # for inventory purpose. 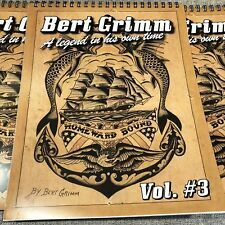 It includes work by Sailor Jerry Collins, Mike Malone, Owen Jensen, Bert Grimm, Cap Coleman, Ralph Johnstone, Paul Rogers, Huck Spaulding, Joe Lieber, Amund Dietzel, Bob Shaw and many more. CONTENT Full Color Tattoo Flash. From Bill Moore created C.1940. Cool Tattoos. (Qty-1) Cool Tattoos Flash Design Book 64-Pages. This 64 page flash books contains contemporary & avant-garde. All the latest trends in tattoo art! Tattoo Flash Design Book. (You got to get this book, it will be well worth it). Ron Kevie,1942-2012, lived his life as a coal miner, motorcyle rider, Vietnam vet and self-employed tattoo artist for over 45 years. He later owned several tattoo studios in CO, TN and KY. There are small tears, stains and pinholes and is in very used condition. (Qty-1) Skull Style Tattoo Flash Design Book 64-Pages. Tattoo Flash Design Book. Skull Style. with more then 275 designs in 64 pages. (You got to get this book, it will be well worth it). The lettering matches his lettering and several mini design sheets like this are in my possession too, again done by shaw. this style of mini flash was was used at the pike on long beach California by shaw, Grimm and others. Dotwork Tattoo Reference Book. 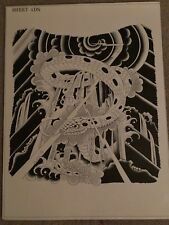 (Qty-1) Dotwork Tattoo Reference Book 64-Pages. The latest trends carried out in dotwork style This book has 64 pages, 200 color tattoo photos. This 11x14 original flash sheet (hand outlined in ink and colored with colored pencil) on stained, worn aged, sun-colored, stained paper. sheet is in good shape for being from the mid 1970s. It has bright and vibrant artwork thats displayed on clean and crisp paper. All these issues will be shown in detail in the pictures. The item in the pictures is the actual item being sold so what you see is what you'll get. 157 Risque Woman With Sword Raging Bull Dragons ETC. These are original colored flash art. These tattoos art are of the large to small variety you get the detailed following. 109 Grim Reaper Devil Motorcycle Skull ETC. ARTIST Mike "Rollo" Malone. CONTENT Line Drawings. WEIGHT. 8 lb. JUST MADE! 100% GREAT QUALITY! But it was his association with Norm Keith "Sailor Jerry" Collins that was a twist of fate that solidified firmly his place in tattooing history. The pictured flash sheet was one of those sheets created and sold by Rollo during that era in 1989. 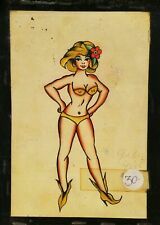 Amazing Vintage Tattoo Flash, 1950’s original hand painted from Canada. Al Newcombe merchant seaman. 9x12 Condition is Used. 1 Sketchbook from 1987. 2 Sketchbook from 1994. ARTIST Sailor Jerry. CONTENT Line Drawings. The set includes. Tattoo Lettering book by Bigg Solo. Lettering and Fonts made easy. Not a copy. original sold by rollo. he worked with lou sciberras in florida, mr. tramp in texas, paul rogers/zeke owen in jacksonville, nc, extensively in texas and biker conventions with many other folks. 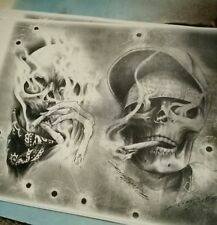 Neues AngebotTattoo Flash Pat Picture Machine 70 SHEETS!!! You might get a couple extra sheets as a gift. There are hundreds of amazing old school tattoo designs that are still being sought after by many tattoo collectors. The answer is nowhere! Mass quantity printing always allows for mistakes when a sheet moves in the copy process. 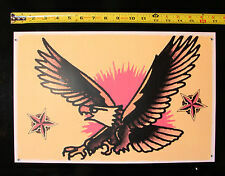 Tattoo Flash Pat Picture Machine 70 SHEETS!! !